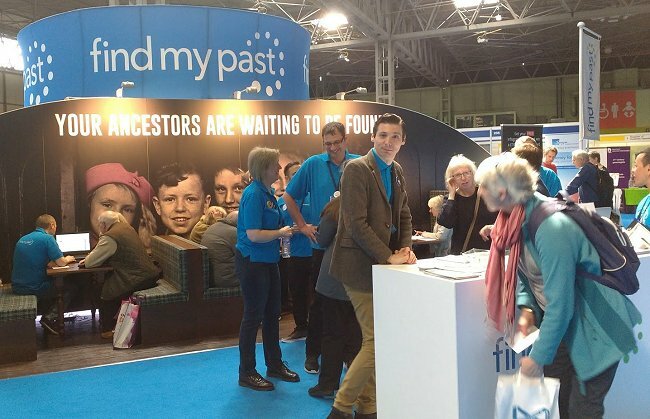 Britain’s annual genealogical jamboree, Who Do You Think You Are? Live, took place at the National Exhibition Centre, Birmingham, on April 6, 7 and 8 this year. It was an experience which for me had much in common with the shows of previous years, but also some differences. One of the differences was that I only attended for two days (Thursday and Friday), rather than all three. Although I had tickets for the three days, I chose to attend the memorial service for the late Sir Harold Atcherley on Saturday 8 April. This was an opportunity for me to pay my respects, and meet some distant Atcherley cousins for the first time (see my Facebook post). Another way in which my show experience varied this year was that I did not get there ready for the opening time of 09:30. This was because I was not feeling 100%, and so decided to set off from home and arrive at the NEC a little later than usual. The main benefit of this was that I could walk straight in on arrival, a welcome change from standing in a massive queue! I also took both days at a gentler pace than usual. 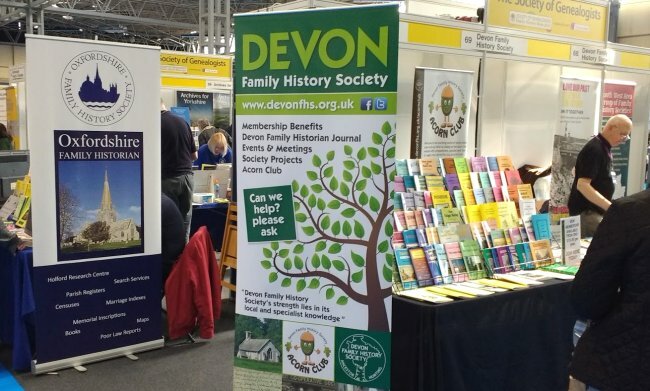 I had some purchases in mind, a number of stands which I wanted to visit, and fellow genealogists I hoped to meet up with, but not an agenda which required rushing around all day. S o, what about the show itself? The ‘big boys’ from the world of commercial genealogy were there as usual of course, with the stand of show sponsor Ancestry being in prime position just inside the entrance to the hall. I visited the stand for two reasons. One was to renew my subscription at a discount only available at WDYTYA? Live. This year however Ancestry took a different approach, handing out cards offering a discount for new subscribers which, I was told, would enable me to renew with that same discount. Which meant even less queuing! 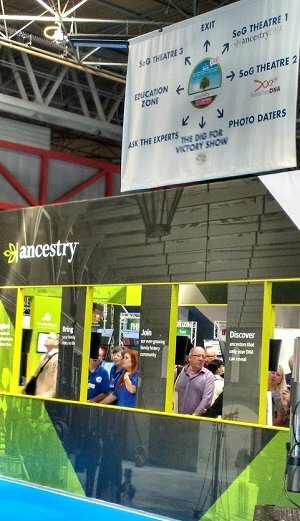 Another reason to visit the Ancestry stand was to snap up a couple of extra Ancestry DNA kits, if they were on sale at a good discount. They were: £49 each is a big saving on the regular price of £79 plus the ridiculous £20 that is charged for shipping. I still have a kit left from last year, but at the show price it’s well worth getting more. I’m always on the look-out for close relatives who would be willing to join my genetic genealogy journey in exchange for a free kit. My purchase paled into insignificance alongside that of The Genealogy Corner blog author Daniel, who bought ten! I decided against my original plan to ask once more about Ancestry’s lack of a Chromosome Browser for analysing their DNA results – it’s pretty clear that the company intends to continue ignoring its customers’ demands for this invaluable tool. The recent introduction by Ancestry of ‘Genetic Communities’ is a useful addition, but does not really compensate for the missing chromosome browser. A new contender in the field of direct-to-consumer DNA testing, attending WDYTYA? Live for the first time, was Living DNA. Their offering was also discounted, but at £99 was still way more expensive than the tests offered by Ancestry, FTDNA and My Heritage (the latter was also present at the show). Having said that, the test provided by Living DNA includes autosomal DNA, mt-DNA (maternal line) and, for male customers, Y-DNA (paternal line) too. In addition, for those of us with British ancestry, the autosomal results include a much more detailed breakdown of those regions where our genes have originated. The talk by Living DNA’s staff, High Definition Ancestry DNA Testing in the UK, provided a good insight into what Living DNA is doing and where it is going. The intention is to extend the high definition results available for Britain, to other countries around the world. DNA matching, with Living DNA customers and those of other companies, is also in the pipeline. No WDYTYA? Live is complete for me without a chat with Myko Clelland of Findmypast. As always there’s lots happening at Findmypast and more in the pipeline. The rate at which historic newspapers are being digitised and added to the British Newspaper Archive (and hence also to Findmypast) has increased and provides a treasure trove for family and local historians. Friday’s release of Wiltshire parish records, transcripts from registers created by Findmypast with the Wiltshire Family History Society, was the first of Six Counties in Six Months, and gets these Wiltshire records online before Ancestry’s planned release (which will include register images) later this year. Friday also saw the release of Scottish Catholic records, see Findmypast Friday April 7th 2017. More Catholic records are to come, along with more additions to the US marriage records collection. Although we are still marking the centenary of the First World War, this wasn’t quite so obvious at WDYTYA? Live 2017. The National Archives (which has focussed on WW1 at previous shows), and Lives of the First World War, were both missing from the show this year. (Others noted the absence of the National Army Museum and Forces War Records.) There was nonetheless lots on offer for those with an interest in military history. 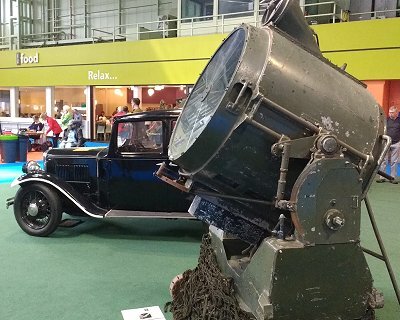 The display area at the far end of the exhibition hall was occupied by exhibits from the Dig For Victory Show. In addition, most of the other organisations which usually attend with stands relating to military history were present. Of particular interest to me was the stand of the MOD Record Office. This had two computers via which staff were able to show visitors what post-1921 service records they had available. I found that these include 28 Atcherley family members, and was able to pick up a few clues as to which branches of the armed forces some had served with during WW2. Military historian Chris Baker tweeted during the show that the MOD had said “that an exciting announcement concerning post-1921 army service records is soon to be made”. Although the nature of the announcement has not been made known, hopefully it will relate to digitisation of those records and/or cheaper access to them (currently a request for a service record involves a £30 administrative fee). Family history societies from around England, Scotland, Wales and Ireland were present as usual, and I took the opportunity to re-join the Shropshire Family History Society. I must remember to complete a Standing Order to prevent my membership from lapsing again in future! 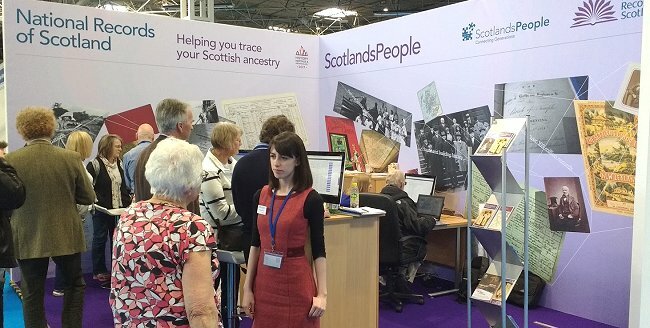 The National Library of Wales had a stand once again, and there was an impressive Scottish presence in the form of a stand occupied by National Records of Scotland and their Scotland’s People website. Family historians with interests in other parts of the world were able to check out regular attendees such as FIBIS (Families In British India Society), Marie Cappart (Histoires de Familles) and the Anglo-German Family History Society, along with the Caribbean Family History Group and newcomers Liliane Hierro (covering France, Belgium and Luxembourg) and Penny Allen (Canadian Genealogy). Companies selling family history books and supplies had stands as usual. I picked up a trio of titles for £25 from Pen and Sword Books, and a range of products from My History for the safe storage of my growing Atcherley Archive, including acid-free photo and document wallets, and a box of the type used in real archives! WDYTYA? on TV focusses on the ancestral stories of celebrities, but said celebrities were somewhat lacking once again at WDYTYA? Live. Until recently the show featured a different Celebrity Theatre on each of its three days, but last year and this there has only been one (Anita Rani and Sunetra Sarker respectively). Sir Tony Robinson was at the show once more of course, but his presentations are basically adverts for Ancestry DNA and I gave his 2017 appearance a miss. I did however enjoy Thursday’s presentation “Behind the Scenes of Danny Dyer’s Episode” of WDYTYA?, which brought three of that programme’s researchers onto the stage to be interviewed by Sarah Williams. The two researchers who appeared with Danny on the TV programme (Laura Berry and York Herald Peter O’Donoghue) confirmed that in person he was exactly as we saw him on-screen. He was, in the words of Peter O’Donoghue, permanently turned to 11 on the Cockney dial. It was interesting to learn that while an episode of WDYTYA typically takes about three months to research, Danny Dyer’s took five months. Also, the family histories of some previously rejected candidates for the programme are being revisited as the increase in digitised records and newspapers now makes it possible to build full episodes about them. But who needs celebrities when there are so many genealogy friends to meet up with? 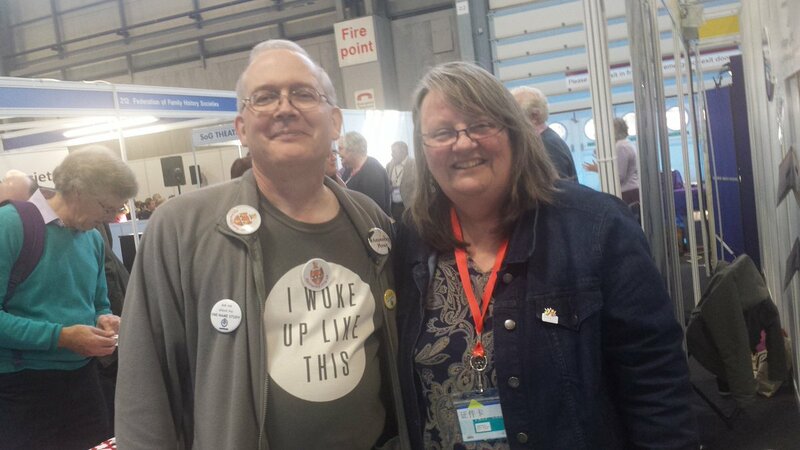 It was great to see in person, so many people who I usually talk to online via Twitter and Facebook (including #AncestryHour tweeters Daniel, Andrew, Sonia and Jane, pictured above). In fact, the only thing I really missed about not being at WDYTYA? 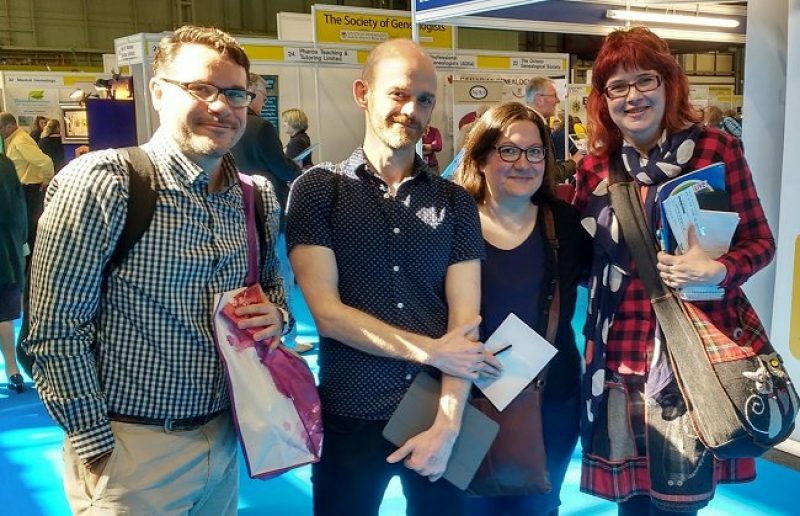 Live on Saturday was the opportunity to meet more genealogists – otherwise I felt I had got what I wanted from the show in the two days when I was there. Is this a sign that the show is losing some of its appeal and usefulness? Perhaps. I was not the only one to notice the apparent increase in the number of non-genealogy stands this year. If the organisations and companies paying for these stands are helping to keep the show going, all well and good. But if they are there filling gaps left by family history organisations which can’t afford the ever-increasing costs of attending, this does not bode well for the future of WDYTYA? Live. Having said that, I enjoyed my time at this year’s show and certainly plan to attend in 2018. There was a brilliant range of talks and presentations, many great bargains to be had, and lots of experts ready and willing to share information and advice on the stands. For now at least, WDYTYA? Live remains an unmissable part of my genealogy calendar. Copies of handouts or slides provided by speakers at WDYTYA? Live are available from the Society of Genealogists.